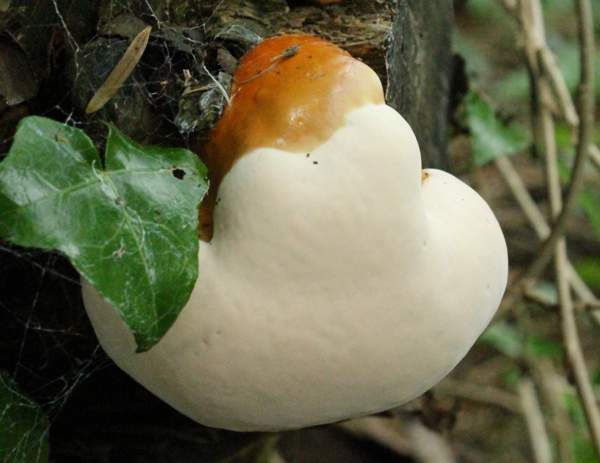 Ganoderma species are notoriously difficult to identify with confidence because of their variability but, unlike other species in this genus, which are primarily found on hardwoods, Ganoderma carnosum is an annual bracket which grows on conifers, and in Britain it is nearly always found on Yew trees. At maturity the pores of these bracket fungi release brown spores. 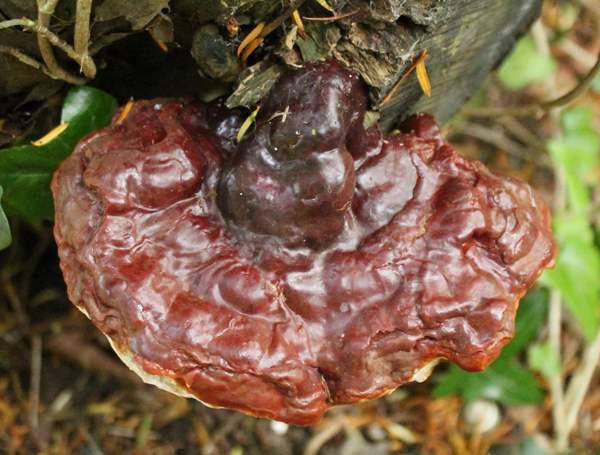 A rare species in Britain, where it has been found in England and Scotland but is not formally recorded (as of September 2015) in the FRDBI from either Wales or Ireland, Ganoderma carnosum occurs also in many parts of mainland Europe including Austria, Czech Republic, Denmark, France, Germany, Hungary, Italy and Spain. This species has been reported from Japan and Mongolia. The species was described scientifically in 1889 by French mycologist Narcisse Theophile Patouillard (1854 - 1926), who gave it the scientific name Ganoderma carnosum by which this bracket fungus is still generally known today. 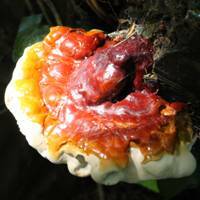 Synonyms of Ganoderma carnosum include include Fomes carnosus (Pat.) Sacc., Scindalma carnosum (Pat.) Kuntze, and Ganoderma atkinsonii H. Jahn, Kotl. & Pouzar. From the Greek Ganos-, meaning brightness or polished to a bright sheen, and -derma meaning skin, comes the genus name Ganoderma - a reference to the lacquered appearance of the caps of these bracket fungi. The specific epithet carnosum is derived from the Latin carnem and means 'fleshy' - the same Latin source also provides us with carnal (of the flesh) and carnage (slaughter). 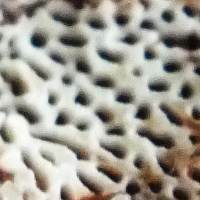 The lower (fertile) surface is covered in roundish or angular creamy white to ivory pores typically 0.15mm across and spaced 3 to 4 per mm. 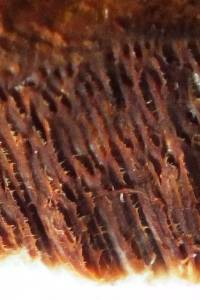 The pore surface turns ochraceous brown with age or when bruised. The chocolate brown tube layer is up to 2.5cm thick, and the flesh immediately above the pore layer is a darkish chestnut brown. 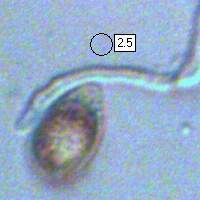 The flesh of the stem and that immediately below the pileus (cap 'skin') is whitish, becoming hazel brown with age. 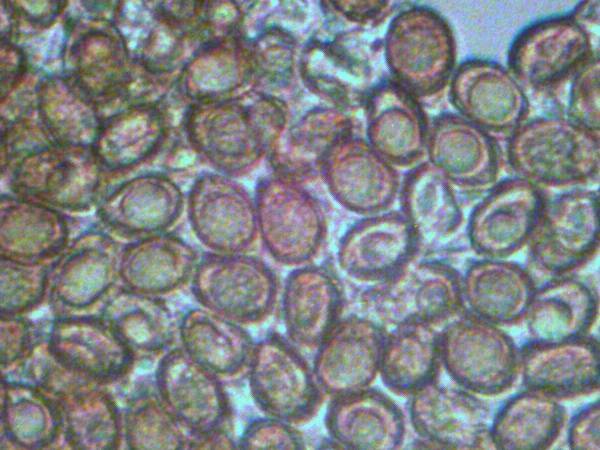 Ellipsoidal to ovoid, 10-13 x 7-8µm; ornamented with many warts. (Basidia are four-spored.) Inamyloid. Trimitic. 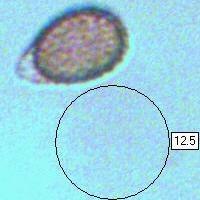 The generative hyphae are thin walled, 2.5-6µm in diameter and septate, with clamps. Parasitic/ and then saprophytic, almost exclusively on Taxus baccata (Yew trees) in Britain but more commonly on firs (Abies species) in central Europe. Like other Ganoderma species this bracket fungus causes white rot. On living trees it is nearly always fround growing low down on trunks or emerging from just below the ground where it is attached to tree roots. 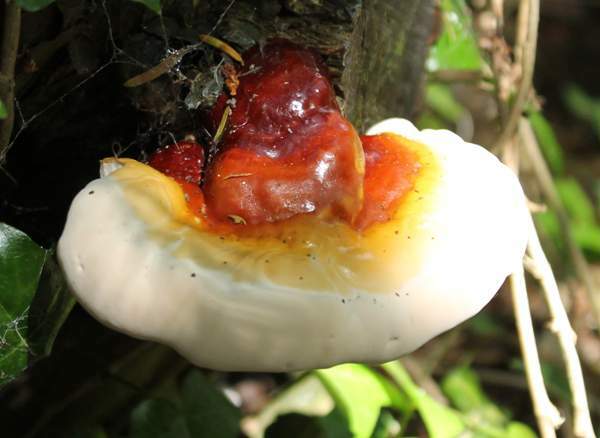 Ganoderma carnosum grows sometimes on felled trunks, and in some parts of Asia it has been produce in cultivation using bags of sawdust as the growing substrate. This annual bracket fungus releases spores in summer and autumn, and new fruitbodies can appear on the same host for several years. Ganoderma lucidum is very similar but usually somewhat redder; it grows almost exclusively on hardwoods and has smaller spores. In the Far East a wide range of medicinal claims are made for for various Ganoderma species, and extracts are made from the brackets and from their spores. We know of no recipes for soups or other mushroom dishes based on this tough bracket fungus. Patouillard, N. Le genre Ganoderma. Bull. Soc. Myc. France, vol. 5, p. 64, 1889. Mattheck, C., and Weber, K. Manual of Wood Decays in Trees. Arboricultural Association 2003. Niedermeyer, T H et al; Antiviral Terpenoid Constituents of Ganoderma pfeifferi. J Nat Prod. 2005 Dec; 68(12): pp1728-31. This page includes pictures kindly contributed by Dave Lawman.